Fisherman's Wharf and SoMa (South of Market Street) are good opportunities to explore the local culture. Escape the urban bustle at China Beach and Baker Beach. There's much more to do: step off the mainland to explore Alcatraz Island, snap pictures at Golden Gate Bridge, appreciate the extensive heritage of Twin Peaks, and stop by Union Square. For reviews, where to stay, photos, and more tourist information, read San Francisco vacation planner. Saint John, Canada to San Francisco is an approximately 18.5-hour flight. The time zone difference moving from Atlantic Standard Time (AST) to Pacific Standard Time (PST) is minus 4 hours. Plan for a bit warmer temperatures traveling from Saint John in September, with highs in San Francisco at 27°C and lows at 16°C. Wrap up your sightseeing by early afternoon on the 25th (Mon) to allow enough time to travel to Seattle. 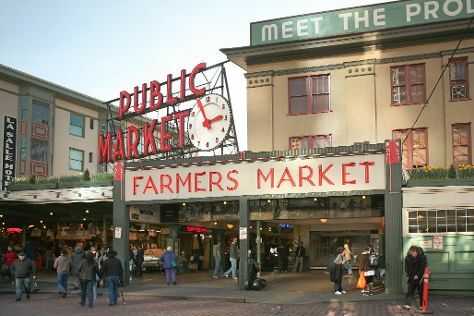 Do some cultural sightseeing at Pike Place Market and Seattle Art Museum. Get in touch with nature at Alki Beach and Hiram M. Chittenden Locks. The adventure continues: admire the masterpieces at Chihuly Garden and Glass, examine the collection at The Museum of Flight, take in the exciting artwork at Glasshouse-Studio, and admire the landmark architecture of Space Needle. To see ratings, more things to do, reviews, and tourist information, read Seattle vacation trip planner. Getting from San Francisco to Seattle by flight takes about 4 hours. Other options: drive; or take a bus. In September, plan for daily highs up to 24°C, and evening lows to 14°C. Finish up your sightseeing early on the 28th (Thu) so you can travel back home.